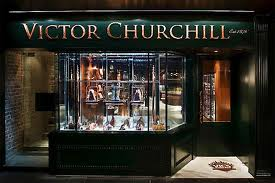 There is a butcher shop in Sydney called Victor Churchill. It was established in 1876 and in 2009 was redesigned by Dreamtime Australia Design. From the front it looks like something Dickensian. 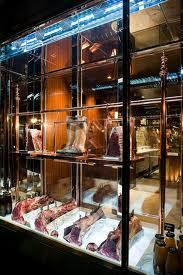 The display in the window of the shop, however, gives a little hint of what is waiting inside. The interior of this shop is unbelievable. 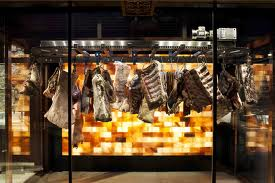 To me, it is like a meat-themed art installation. It is so far removed from what I would have imagined a butcher’s shop could be, that I find it fascinating. There is a revolving meat rack, and what appears like the most security protected tiny piece of meat in the world. I have never visited this shop in person, but would love to do so. However, I don’t think it would fit quietly into small town Ireland. Think of the talk it would generate? Very impressive for quality of interior finish though. And Oprah gives it her seal of approval. What more could you want? Check out website: www.victorchurchill.com for the alternative butcher shop. Reblogged this on Seán Bourke.